Chapter Four | It's how we do life. It's how we do life. I’ve always loved public libraries. I remember going as a child. I’d check out a hefty stack of books and proudly carry them to the desk, check them out on my own card, then carry them to the car. I’d read all the way home and would usually have 3 or 4 books finished by the time we got there. By the end of the day, I would have finished my whole stack. I’d be ready to go back the next day, but I’d have to wait until the next week. While I waited, I’d read them again and again. During my junior high and high school years, we lived in a rural area. When we made trips “into town”, we didn’t make it to the library because it wasn’t the part of town we were going to. I resorted to buying my own books (and bags of mixed nuts from Morrow’s Nut House) at the mall with my allowance. During the school year, I’d get books from the school library. My senior year, I spent one of my free hours working in the library. It wasn’t a terribly busy place, so I spent a lot of time lining up the books with the edges of the shelves. Sound boring? Not for someone like me! I loved being able to see all the books the library had. I was introduced to many contemporary authors that way: Robin Cook, Victoria Holt, and others. When we moved to the Dallas area, I sought out several libraries in the cities surrounding us. I still have (expired) library cards from larger cities and smaller towns on the north and east sides of the Metroplex. I’d take the boys weekly for story time and more often in the summer when their special programs were in full force. As they got older and I homeschooled them, we joined a wonderful kids’ book club that our 4-H leader led. I read with them as well as on my own. The boys are enrolled in a small Christian school now. They don’t have as much time for reading for pleasure during the school year, but during the summers I make sure they have something to spend time reading each day. But we still visit the library frequently during the school year. Each trimester the high school students must write a lengthy research paper. (Yes, that’s three research papers each school year; twelve during their high school career.) In the search for resources, we visit the library and check out obscure books (for difficult historical and literary topics). Caleb’s winter trimester research paper was on slavery and the 13th Amendment. We checked out six books, which he kept in a stack on his desk when he wasn’t using them. Once he had turned in his paper and he knew he wouldn’t need to refer to the books for anything, he brought all six downstairs and put them on the table. I put them in a crate in the trunk of my car. A few days later I stopped off at the library and put the books in the book drop since they were closed. One, two, three, four, five, six. Later that week when I checked my account online, records showed one of the books hadn’t been turned in. I knew better, but I thought maybe they were just slow in processing them. Not long after that, I got my regular email notification that my books would be coming due in a few days. That book was still listed as being checked out to me. I was busy, and I had time to renew it and deal with it later, so I did. And again. And again. I stopped off at the library a few weeks ago to finally check on what to do about it. The lady at the circulation desk requested and shelf check for the book at all four branches. She told me to watch my account. If they found the book, they would take it off my account; otherwise I would be responsible for it. Last week, I got another email notification about a book coming due. It hadn’t been found and was still on my account, so I stopped by on Saturday afternoon to follow up on it. I talked to a different lady at the circulation desk (on purpose). She checked my account again and said a shelf check showed the book had not been found. I had to pay for it. I told her that I knew I had returned it and that I had put it in the book drop on the side of the building; unfortunately there was no way I could prove it. I wanted them to check around the book drop area just in case it had gotten lodged somewhere. (It was a really thick book.) But no. I could pay it or lose my library privileges when the final renewal ran out in three weeks. I sighed, loudly unzipped my wallet, and tossed down $32 cash and two quarters. While the clerk painstakingly wrote out my receipt, I debated whether I wanted to check out the books I had chosen. I muttered, “Well, I won’t be using the book drop anymore.” She ignored me and continued writing the receipt. Then she handed it to me along with my new printout of books I had checked out. I was tempted to stick those books in the book return window as I walked past, but I kept them. Still, it would be easier to just download ebooks and let them automatically be removed from my device when time is up. As much as I still enjoy the feel of an actual book in my hands (which I think I blogged about long ago), it’s not worth the headache if I have to deal with the library losing books that are in my name. Then again, if this is the only bad experience I’ve had in the nearly 13 years I’ve been using that particular library, the odds are pretty good it won’t happen again. The whole experience just leaves a bad taste in my mouth, though. I don’t want to take the risk. I will continue to check out books from there, but I will not use the outside book drop anymore. I’ll make the library trips only during operating hours. It’s really not that inconvenient. It’s only five minutes from home and from work. But if it happens again, I really will have to come up with another option. When I see something I like, I check to see if it’s something I can make. 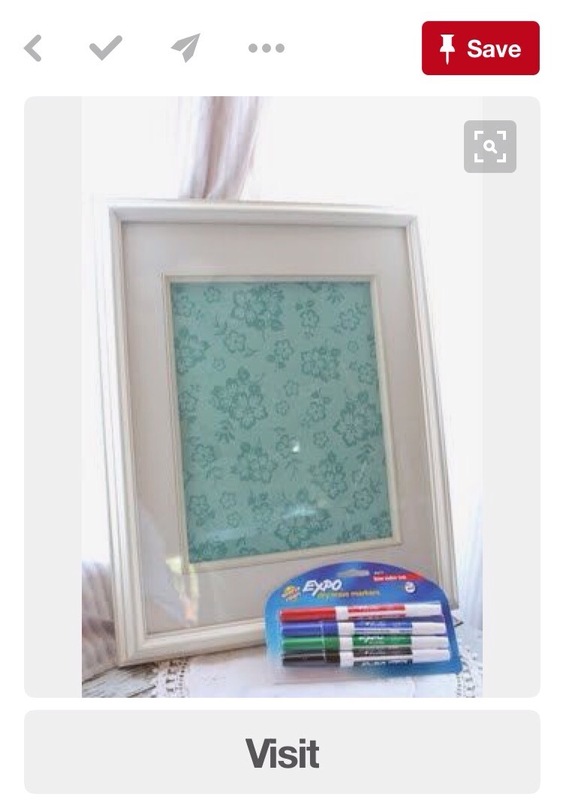 I like being crafty and creative, so I’d much rather make something than buy it. 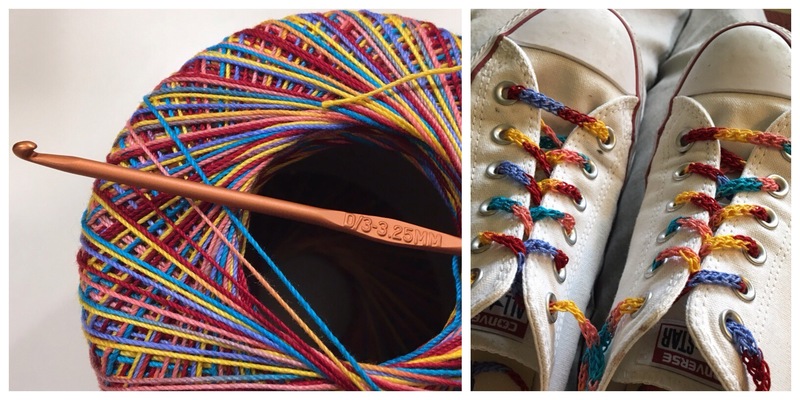 After a friend had posted a picture on Facebook of some cute, colorful shoelaces her daughter had crocheted, I saw a new project to put at the top of my queue. As is often the case with me, I look at yarn, think about what I want and how I want something to look, look at more yarn, and think some more before finally making my decision. I searched Pinterest for ideas and instructions, but all the ones I saw were made with a thicker yarn than I wanted to use. I Googled them and still didn’t find what I was looking for. Finally I couldn’t hold off any more. While I was browsing at Hobby Lobby last weekend, I decided to just buy the colorful crochet thread that I kept going back to. Yesterday morning before we left to spend the day at Six Flags, I decided I needed a small project for the road. I grabbed my thread and a tiny crochet hook and looked up instructions on foundation crochet. Originally I was going to make them with foundation double crochet, but that seemed too wide. I ended up using one row of foundation half double crochet. For the correct length, I measured against the laces in my white Converse tennis shoes, which the new colorful ones would be replacing. 1 ball Artiste acrylic crochet thread (I used color 108, Carnival) *There is a lot more thread on the ball than what is required to make one set of laces, so find another project for it or make extra sets for yourself or your friends. They’re going to want some, too! Chain 3, yarn over, insert hook in 3rd chain from hook, yarn over and pull up loop (3 loops on hook), yarn over and draw through 1 loop (1 chain made), yarn over and draw through all 3 loops on hook – 1 foundation half double crochet stitch made. *Yarn over, insert hook under both loops of the chain made in last stitch and pull up loop, yarn over and draw through 1 loop (1 chain made), yarn over and draw through all 3 loops on hook. Repeat from * for desired length of shoelace, then tie off and work in ends. I can’t wait to wear them! I’d like to tomorrow, but a big guy in chunky boots stepped on my little toe at church this morning and it hurts to be touched. I don’t know if I’ll be able to stand a shoe for a few days… In the meantime, I think I’ll buy another ball of a different color and crochet some laces for my navy Converse shoes. As the crow flies, we’re probably half a mile from a major interstate highway and less than two miles from another busy freeway – and they intersect not much farther away. Needless to say, we hear a lot of traffic. Often we hear the bad result of a lot of traffic – emergency vehicle sirens. I didn’t notice the traffic sounds when we were looking at the house as buyers. 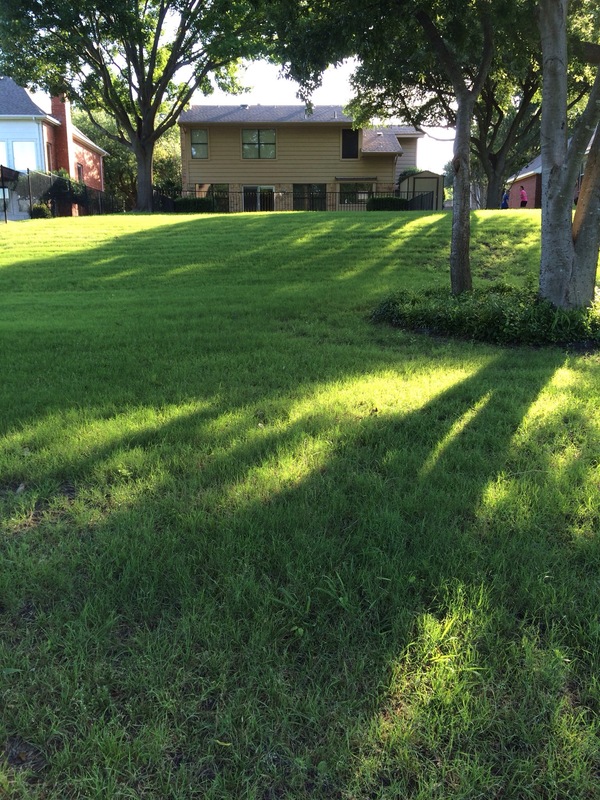 I noticed the great location and the close proximity to work, church, school, friends, etc. I noticed the beauty of our street, the neighboring yards, our yard, and the golf course behind us. One of the first things I wanted to do was sit on the back patio and enjoy the surroundings. Then I realized the surroundings included the highway noise. At first it was bothersome. It seemed loud outside, and I could hear it clearly at night when I went to bed. It greeted me in the quiet mornings when I would do my Bible study. It was always there. And then, suddenly, it wasn’t. It’s really still there, and I still notice it at times. But as I sit in my patio chair and relax after work, it quickly fades into the distance as my focus shifts to watching the golfers play through or watching the squirrels scamper from tree to tree. It becomes peacefully silent. At night as I’m getting ready to sleep, it doesn’t keep me awake like it did the first few nights. It’s now a lulling white noise that helps me drift off. In the mornings, after a (usually) silent night, it seems a little louder than normal. But when I settle in to do my Bible study, my focus shifts. It’s no longer the only sound I hear. It becomes mere background noise that’s only noticed if I hear sirens in the distance. It makes me wonder how eerily silent it would be if the traffic noises stopped altogether. I thought about this last week after the interstate was shut down on both sides because of a major accident involving a jack-knifed semi that looked like it had partially jumped the concrete divider for the HOV lanes. I was driving along the service road to go pick up the boys from school, so I couldn’t look enough to see the details. I made a mental note to go home a different route and went on my merry way. I thought nothing of the traffic sounds, or lack of them, because I was listening to the radio. But as I was sitting outside that evening, noticing the traffic in my first minutes of getting settled, I started wondering what it sounded like in my back yard earlier when all the traffic was at a standstill. Would the silence have been distracting, now that I’m so accustomed to the white noise? I love making things, and I love giving handmade things as gifts. Sometimes there’s just not enough time, or maybe I just don’t have a good idea. I usually reserve the handmade gifts for Christmas and get an early start – the beginning of September. Still, not everyone gets something handmade and I have to resort to the usual stand-by gifts of candles, body wash, gift cards, etc. It was saved to her “What a GREAT idea!” board, and I agreed. First stop: frames. It had to be just right. No metallics or fine lines. No ordinary colors, but nothing too garish. It didn’t need to be too big, but it did need to be large enough to write on easily with a dry erase marker. 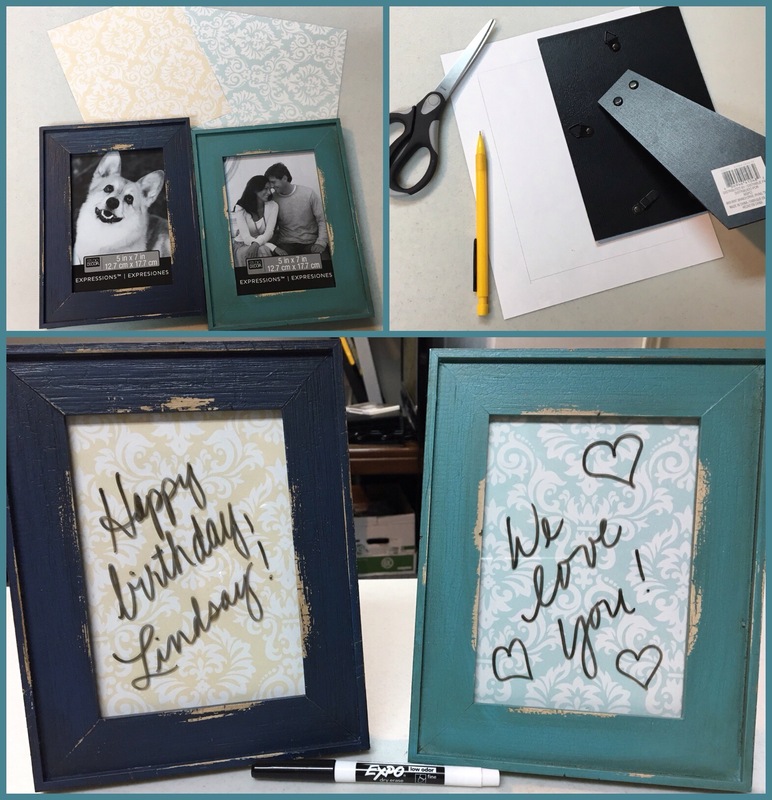 I found some distressed 5×7 frames in colors that coordinated with her decor, and since they were 50% off, I decided to buy two for her. Second stop: paper crafts. I am not a paper crafting kind of person. I tried to be, but it just wasn’t my thing. After our recent move I gave away all my scrapbooking materials, so I knew I would have to find something there. I loved looking at all the patterned papers and found several that fit themes in her house: birds (in her guest bathroom), bicycles (in her living room), etc. They would’ve been perfect – but they were too busy for background papers. It would be too hard to see whatever had been written across them. I finally decided on two simple patterns in different colors that would coordinate with the frames and the rest of her decor. Third stop: an office supply store for a pack of dry erase markers. Of course, I had to complete the gift. I couldn’t give her cute message boards and expect her to go out and buy something so she’d be able to use them. For that, I went with basic black markers. No need for clashing colors or shades that wouldn’t show up against certain backgrounds. Once I got home, I got right to work. I measured and cut the paper to fit perfectly – and to be symmetrically displayed. (Yes, I’m that person.) I put them together and wrote a special note on each one (with my own dry erase marker) since I didn’t buy her a card. (I hate shopping for cards…) Then I wrapped each frame in tissue paper and placed them carefully in a gift bag. I kept texting her to see how close they were: Where are you? What’s your ETA? Now where are you? Almost as soon as she arrived, I had her open her gift. I was excited! And she was excited when she opened them! She started sharing her plans for using one in her guest room (for personalized messages to her guests) and one in her living room. My other younger sister’s birthday is the end of this month. I can’t wait to peruse her Pinterest boards and find something fun to make for her. This revolutionizes the way I will approach gift-giving from now on! A lot has happened in the last nearly 2 1/2 years since my last post. School got crazy and life got busier. Basketball happened (for both boys, on two different teams) and took over our lives. Then others things took control. Finally we decided we needed to move closer in to where life happened. It seemed all we were doing at our house was sleeping. Last spring, we got our house ready and put it on the market. Since it was a seller’s market, it sold in no time. The house was in a good location and was in really good condition. It was a remarkably easy process! We had received one offer before it actually listed, then two offers came in just a day apart after showings began. Within a week, we were working out details over offers and counter-offers. We were starting to feel the pressure to find something for ourselves. Our realtor had us wait until we had an actual contract on our house and were past the options period (where the buyers could no longer back out without a large penalty) before we actually looked at anything. While we waited for that step, we watched the realty websites like hawks, finding dream homes only to have them go off the market within days. It was so frustrating – but that was nowhere near what we were about to experience! The first day we were actually able to go look, one of my friends texted me a picture of a house down the street from her that was just about to go on the market. She called the realtor, I called the realtor, I sent my realtor the picture. We wanted to see that house! But they weren’t ready to start showing until the next day. My husband’s boss also lived down the street from that house, so they talked about it and he gave high recommendations on it. The realty site listed photos that night and we made a split decision to make an offer, sight unseen. It felt right. The sellers agreed to consider our offer, but they still wanted the house to show to see if there would be other offers. They wanted a week. They next day we were able to see the house – along with about 3 other groups at the same time. That was awkward because we felt like we couldn’t really look at things critically or discuss anything with our realtor. We didn’t want anyone to overhear anything we said and maybe gain an advantage. Still, we loved it! It was the one we wanted. We just had to wait… During that wait, we both spent a lot of time praying about it. Our realtor stayed in contact with the sellers’ realtor over the course of the week. Things looked good one day and bad the next. Up and down, all week long. We decided to go the next weekend and look at some others houses we were interested in. Since things were looking bad for the house we really wanted, we decided to make an offer on our second choice. If they both ended up being accepted, we would choose the first house and only lose a small amount of earnest money on the second. It would be worth that to not be left with either – and our time was running short. The closing date on the house we were selling was getting closer. The offer on house two was declined. We were back to waiting to hear something about house one. They had decided to show for another week because there was a lot of interest (nice house and a prime spot on a golf course) and they had gotten several offers. Things were not looking good for us. Still we prayed. Things got blurry after that. We kept finding houses online that we liked, but they came and went quickly. Nothing looked to be going in our favor. Then we heard that the sellers were still considering our offer – and one other. They countered our offer and we countered back. We waited to hear. Things looked bad again. We were at the point where we were ready to rescind our offer and start over with looking elsewhere. It was too stressful and there was no longer any joy or excitement in the process. We felt like we were being toyed with. We told our realtor that whatever answer they gave, we would not counter again. We would either accept or walk away. My prayer had changed from Please let us have this house to If this house is meant to be ours, You will work it out; and if it’s not, it’s because You have something even better for us. At the time I couldn’t imagine what that would be because the house, the location, the neighbors and friends there – everything about it – seemed like the perfect situation for us. We got the call on a Thursday night, right in the middle of our sons’ school play. I returned our realtor’s call at intermission with a knot in my stomach. She knew how frustrated we were with the whole thing, so she immediately said, “It’s good news!” Our final offer was accepted. They were going out of town for the weekend, but they would sign the paperwork their realtor was planning to send them, then overnight it to us for our signatures. For some reason, that didn’t happen. We had to wait until the next week. Doubts were beginning to creep in again. With all the offers and counter offers and new contracts being written and rewritten and taking so much time in between, our closing date with our buyers was just around the corner. The closing date on the house we were buying was still a month away. Thankfully our realtor had the foresight to insist on a clause with our buyers for a month-to-month rent-back policy. And our buyers were very gracious in letting us stay in our/their house a month past closing – rent free! They were also willing to allow a second month if needed, but we would pay rent for that. Thankfully we only needed that one month. We closed on our new house in early June and started moving in the following weekend. I’m just glad it’s all done – and that we got the house we wanted. It’s neighborhood we wanted to be in. It’s close to our church, where I also work. It’s closer to the boys’ school and to my husband’s work. The boys already had several friends in the neighborhood, and now it’s so easy for them to be able to hang out at one house or another. We knew more than 15 families here when we moved in. We’ve since found out others we know live here, and we’ve met some new families. Our experiences with buying and selling were so different! And our experience with buying in a buyer’s market in 2009 was so much easier than our experience with buying in a seller’s market in 2016. We learned a lot and, while our hope is to be done with moving – at least until we are no longer able to physically manage things there, we can be better prepared mentally for the next time. Our house from the back, from the edge of our property line. Basketball practice times aren’t ideal, but we’ve got good carpool situations to make them easier to handle. Early morning practices have me getting out of bed at 5:00, leaving at 5:15 with Caleb, meeting his ride at 5:30, then coming home to get ready for the day. Since Mondays aren’t school days, practices are mid-afternoon: 2:00-4:00. It’s a little tough for working parents, but we figured out a system. Lori brings Jackson to the church and takes Jacob with her so he can hang out with Aidan. Stephanie takes Jackson and Caleb with her, picks up Andy, and takes them all to school for practice. Billy picks up Caleb, Jackson, and sometimes Andy, then takes Jackson home and picks up Jacob. If he has Andy, he brings him by the church before heading home with the boys. We call it the Teenage Shuffle. It’s crazy and confusing, but it works. After reading a little more than half the book, I went in search of sulfate-free shampoo, an alcohol-free conditioner, and silicone-free/paraben-free/alcohol-free gel. That’s hard to find within a reasonable price range! I finally found what I needed and spent about $16 for three items. For the last week, I’ve been sulfate-free shampooing (three times, but I need to do it less), drenching my hair in conditioner and finger combing it as I rinse it out several minutes later, squeezing out the water with a microfiber towel (instead of towel-drying with a hand towel), and scrunching with gel (without combing it first – because the only time I should comb it is in the shower). Then leaving it alone. Keeping my hands out of it. Not touching it up until it’s completely dry. That’s hard to do! Once I get my own personal care routine down, I think the rest of our morning routine will flow more smoothly.